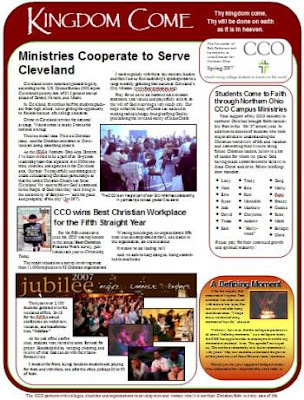 Read about it in my latest CCO newsletter. 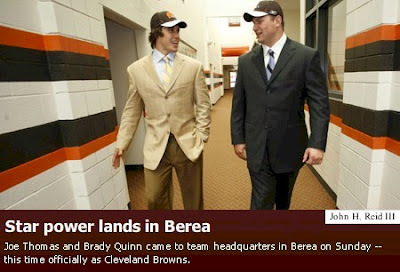 When it's all said and done, Brady Quinn will be very glad that the Browns picked Joe Thomas with the third overall pick. Now he has somebody who will be protecting his back side for the rest of his career. Read Peter King's inside story ("Draft dreams come true: How Browns nabbed Quinn"), detailing how Browns GM Phil Savage worked this draft to get two of his top 5 choices. According to this question, the greatest issue of the Christian faith is this: We need to get into heaven. I affirm that the gospel addresses the afterlife, but I think that we may need to reframe the gospel to reach a new generation of post-Christian and post-modern people. Rob Bell’s term for this is “repainting the Christian faith,” the subtitle of his book, Velvet Elvis. Maybe instead of focusing in on the benefits of placing our faith in Jesus for the afterlife, we should start talking more about how doing so changes us and our world now. Maybe we should see heaven and hell here on earth in our present experiences, and be used by God to be transformation agents, shifting the tide from hell toward heaven. Things like 9/11, the Virginia Tech shootings, corporate greed, shady politics, abortions, pandemics, poverty…they all can be seen as hell on earth. We look forward not to a time when we will go up to heaven to be with God; we look forward to the time when God will come down to us and live with us here on earth forever. I’ve written about this Reformational worldview a lot here at Vanguard Church. It states that God’s ultimate goal is to restore the Creation. This is why we talk about rebirth, redemption, reconciliation, resurrection, renewel. God is reclaiming his creation, renewing his creation, restoring his creation. In the end, Jesus does not proclaim that he is starting from scratch to make all new things. No, his proclamation as the Alpha and the Omega is “I am making all things new!” (Rev. 21:5). He brings to its culmination what he began with his resurrection. The renewal of all things! 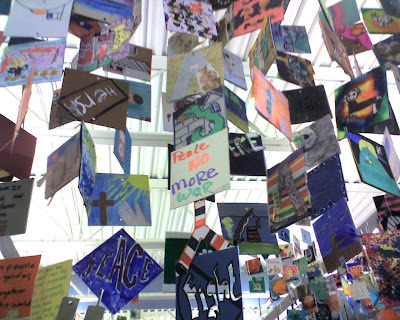 My kids' elementary school's art teachers had each of their students depict their concept of "Peace" on a 4" x 4" square. 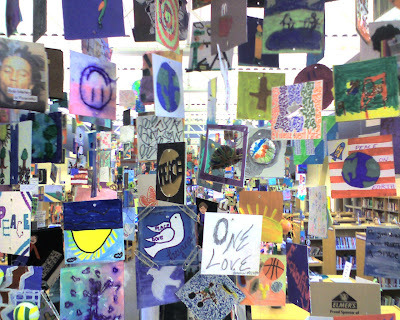 Then they hung them all up in the library for a special art show called "The Installation of Peace." I thought it was wonderful. 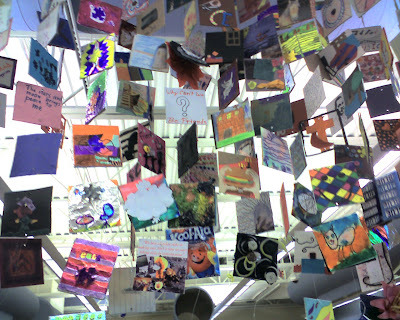 Here's a few snapshots of some of the display. “Do not repay anyone evil for evil. Be careful to do what is right in the eyes of everybody. If it is possible, as far as it depends on you, live at peace with everyone” (Romans 12:17-18). I’ve been hammering this for what seems like years here at Vanguard Church: The Gospel is more than forgiveness of sins. The Gospel is more than getting your ticket into heaven at the end of this life. The Gospel is more than being declared “not guilty” because of the penal substitutionary atonement of Christ. The Gospel is about Restoration. Restoration of Shalom. We need to start seeing the gospel as being bigger than penal substitution. If salvation is not about holistically restoring us, then it is a truncated gospel. God’s intention is to restore us to the way we are supposed to be. If our starting point in understanding the gospel is that we are sinners, then the gospel’s main point is simply to forgive our sins. But if our starting point is that we are not living in a Shalom relationship with God, others, and the rest of His Creation, then we have a much larger gospel. We need to think beyond the gospel of "sin management" (as Dallas Willard calls it). In addition, what often gets tagged onto this smaller, truncated Gospel is this: Since our bodily life is so sinful, salvation is about getting us out of this earthly life and into some heavenly existence. For some, the main thing is awaiting “the rapture,” for others it is looking forward to some heavenly ethereal existence with God where they will be singing the Hallelujah Chorus for all eternity. But this tag-on to the gospel is Gnosticism in that it implies that material existence is an intrinsically evil thing. We need to regain an understanding of the Gospel that embraces restoration, which will make our platonic and/or Gnostic heresies fall by the wayside. That “harmony with its maker” is the definition of Shalom. That is why our Savior is called the Prince of Peace. He is the One who restores Shalom to the world. Salvation is the restoration of Shalom. Let’s get back to the Gospel of Shalom. 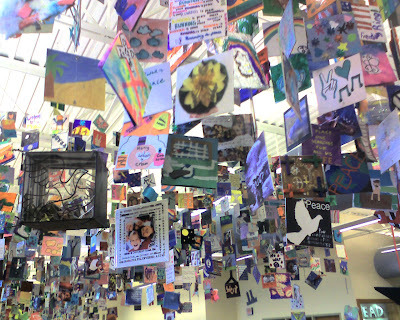 see "Predicament #1: The Lack of Shalom"
"When a young person dies, a universe of possibility dies as well." As someone who really, really loves college students, I watched the news channels tonight and just sobbed. As Area Director for the CCO, a college outreach ministry, I pray daily for college students. I work every hour of every work day seeking to help college students connect with God and establish a future of purpose that will transform the world around them. This is my life. As I watch the haunting images on my TV screen, I think of the students I meet every week: their smiles, their exuberance, their wide-eyed wonder at the possibilities in front of them. When our ministry is at its best is when we succeed in helping to turn on the light for students – for them to understand that life has meaning and purpose, that God is calling them into not just a job for the sake of the “American Dream,” but into vocation for the sake of bringing God’s kingdom and God's will on earth as it is in heaven. I find few things as exciting than knowing that a college student gets it – that their life can be about being a part of God’s grand plan of redemption and restoration. I see hope in this generation. I see possibility. …it just makes me weep. To which most level-headed people would react by scrunching their brows and allowing their jaws to drop. How is it good, in any way we can imaginably define, that at least twenty college students are killed by a gunman? How is this anything but what the president of the university, Charles Steger called it, “a tragedy of monumental proportions”? Any other assessment of this awful news is ludicrous. I just talked this morning with a friend who has long-abandoned the evangelical faith of her upbringing. She has just learned that her 14-year-old son has been diagnosed with a tumor in his face the size of a man’s fist. This week they seek to get more advice from medical specialists to surgically remove the growth. She told me that many of her evangelical family and friends have gone into a strange mode of quoting Bible verses to her and telling her that God’s in control and that he has a purpose for this suffering. It is shocking to her. She looked me in the eye and said that all she really needs is for someone to be Christ to her – to come alongside her and suffer with her. I apologized to her on behalf of these Christians, telling her that we say we follow the “Suffering Servant,” but we are often not very good suffering servants ourselves. As I drove home, I thought about this Jesus Christ we follow. Jesus came and lived our pathetic, frustrating life. He talked about righting the injustices in the world. He said that the world was not the way it is supposed to be, explaining that sin is wreaking havoc on God’s creation, especially us humans. And then he said that HE was the One that could move the world back toward God’s intentions. He spoke of the redemption of all things, the new creation, the making things right again. And then this Jesus did something completely unexpected – he went to the incredible extreme by dying on the cross. He took on the worst the world can deal us, unjustly suffering at the hands of the empire. Why did he do that? Because the world was not the way it was supposed to be. Because God’s will is often times thwarted by evil people and evil systems and evil institutions. The cross reveals that God’s omnipotence is displayed in self-sacrificial love. The cross reveals that the world is an incredible mess – how else can we explain the execution of the only absolutely innocent man? The cross reveals that classroom mass murders and 9/11 tragedies and heart aneurysms and tumors in kid’s faces are all thwarting God’s will. God does not want college students bleeding to death. God does not want a 14-year old to have his face carved away because a tumor is taking over his skull. Ted Gossard's father passed away. Ted is a good blogging friend, a sincere brother in Christ. The good news is that his father was a believer in the One who has victory over death. Our praise to Jesus Christ! 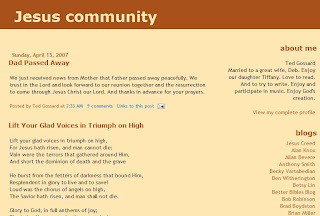 Leave a comment over at his blog, Jesus Community. I got this e-mail from a friend who is open to spiritual things, but would not count himself a full-fledged "believer" like I am one. Reading the latest issue in Newsweek, "Is God Real? 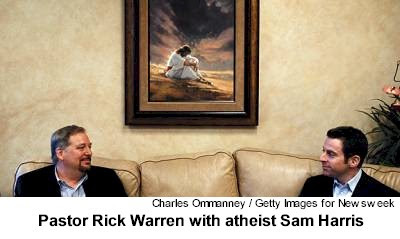 ", with a corresponding debate between Pastor Rick Warren and Atheist Sam Harris ("The God Debate"), I came up with a thought or two. In the article, the author states: "As Mr Harris likes to point out, people who demand evidence for everything else in their lives are somehow all too happy to accept the word of long-dead Biblical authors in a corner of a long dead empire." In the first place, I don't think people of faith demand evidence or proof of everything in their lives. No one does. Or at least has the time or knowledge to even try and gather evidence on everything, let alone have the training or intelligence to understand it or judge the truthfulness of it. Who knows everything? How the car works, what's holding up the bridges, how the universe works, how my toaster oven works, or what is the theory of relativity and what does it have to do with my toaster oven. I would turn the argument around. The atheist takes so much for granted - on faith. Things he no more understands than God. Things that are above his intelligence, beyond his learning, bigger than his imagination, then he trusts that others know enough so that he can safely rely on their knowledge, and he can only too happy to accept this ignorance and go about his life. And after accepting on faith most of what goes on around him, he then expects the biggest mystery of all should be made easy with simple explanations to his inexperienced, untrained mind until he is completely convinced. Me thinks he thinks too much of his understanding powers. As a side bar, I would like to say that I think some on the religious right have the same problem. They want to be convinced with earthly proofs that their God is real. I think you’ve got this right! I’ve been thinking about this myself, wondering what to write concerning this article on my blog. What you’ve said is very close to what I’ve been thinking. On top of that, Harris is using the same-old-same-old arguments that have been used in the modern era against the existence of God – “we can’t prove his existence scientifically so he does not exist.” Ho humm. We (at the CCO) are seeing that this is not what today’s college students are thinking. We are seeing that they have a new openness to spiritual things, an embracing of the mysterious. Not all things need to be proved in a test tube. It’s a great time to be in campus ministry! And you’ve got the religious right’s problem correctly too. They have made the mistake of falling into the same mentality—that if it’s not “proven” then it’s not true. And thus they fight the Harris’s of the world with arguments that seek to place God in a test tube. That’s a mistake, for God is bigger than that; God is more mysterious than that. God, who is quintessentially mysterious, does something about it: He appears in the form of a human being. He says that if you’ve seen him, you’ve seen the Father. He tells us that his intentions are for justice and peace in the world. And then he proves that the way to justice and peace is through sacrifice – suffering at the very hands of the oppressors. And then, to show that this is the way to victory, he arose victorious from the grave on Easter. He says to humanity: You must follow me and my ways. This is the way of truth, the way of life, the way of peace, the way of justice. God becoming flesh does not obliterate all the mystery (in fact it brings up new mysteries, like how could God come in the flesh?? ), but it does show that God is not completely leaving us on our own. Harris, sadly, is on his own. His ethics are based on what he can conjure up on his own. His justice is based on what he can believe on his own. Harris is worried that people of faith base their societal lives on words of “long-dead Biblical authors in a corner of a long dead empire." I worry that our societal lives would be based on the capricious thoughts of people basing their ethics on the latest scientific analyses. Both are based on faith. click on the image to activate, then on the play button. Rob Bell, in his book, Velvet Elvis: Repainting the Christian Faith, has a knack for saying things that get under the skin of traditional evangelicals. In this chapter, he has the audacity to say that Christians don’t have the corner on truth. “Truth is everywhere, and it is available to everyone” (p. 78). Bell speaks of friends who are not Christians who have discovered truth in their love for each other and in their wedding ceremony. He speaks of Muslims who live in the truth of living without debt. And then he tells us that those who think that the truth is only found in the Bible and nowhere else in God’s creation are setting themselves up for a fall. We’ve seen it over and over again: somebody who is raised in a Christian and church-going home goes away to college and consequently walks away from her faith. This is a huge problem. The ministry that I help lead is dedicated to guiding college students into establishing faith and/or flourishing Christian faith in the midst of the college experience. So, what Bell has to say concerning this issue is of particular interest to me. And what he says is exactly right. He says that the problem is that we are not teaching our youth that we should affirm and claim truth wherever we find it. He paraphrases Philippians 4:8 saying, “Whatever is true, whatever is beautiful, if it honorable, if it is right, then claim it. Because it is from God. And you belong to God” (p. 79). Bell talks about how Paul affirmed truth in the words of pagan Athenian poets (Acts 17:16-34) and Cretan prophets (Titus 1:12-13). “Paul affirms truth wherever he finds it” (p. 79). So, back to that Christian college student who is experiencing truth in a context other than the Bible: “Let’s say her professors aren’t Christians. It is not a ‘Christian’ university, and this young woman hasn’t been taught that all things are hers. What if she has been taught that Christianity is the only thing that’s true? What if she has been taught that there is no truth outside the Bible? She’s now faced with this dilemma: believe the truth she’s learning or the Christian faith she was brought up with. Or we could put her dilemma this way: intellectual honesty or Jesus?” (p. 81). This is a shocking statement; maybe an over-the-top statement. But what Bell is trying to get us to see is something that we may not see unless he shocks us. We’ve been inculcated by the evangelical sub-culture to believe that we alone have the corner on truth and that the world “out there” (especially secular universities with their pagan ideas) cannot know truth. Think about it: Many evangelical college ministries see themselves as bulwarks against college education. The main reason many of us want our Christian freshmen to join a Christian college ministry is so that they can be protected from those insidious professors that are seeking to ruin the faith of our young Christians. But Bell has the audacity to say that the problem is not with those pagan liberal professors and institutions, it is with us Christians. We are not training our young people to accept truth as they find it in the world around them; we are not teaching them that all things were created by Christ, things in heaven and on earth; that all things were created by him and for him (Col. 1:16). We are training them to think in a very dualistic sense: that there are things that are sacred (church, the Bible, evangelical subculture) and there are things that are secular (university studies, vocation, everything not dubbed “Christian”). We have moved the word “Christian” from simply a noun (I am a “Christian”) into being an adjective (“Christian” music, “Christian” vocation, “Christian” schooling, etc). We are not training them to embrace the goodness of God’s creation, including that which is good in the culture around us; and we are not training our young people to be discerning that which is darkness and that which is light so that they can become transformation agents to change that which does not reflect the goodness and glory of God into something redeemed. How does Bell tell us to learn discernment between light and darkness, between that which is part of the goodness of creation and that which has been corrupted? He says, “The Bible is filled with stories of God teaching people how to think. How to discern. How to sort and sift and figure out what is true and what isn’t. What is good and what isn’t. What brings life and what brings death. Being a Christian is about engaging the mind and heart more and more, not shutting them off or letting someone else think for you” (p. 86). Amen to that!! The problem with our evangelical subculture is that we are in danger of cutting ourselves off from the maturing process of discernment. Bell’s purpose for this chapter is to show the erroneous thinking (by many of us in the highly individualistic and naïve world of western popular evangelicalism) that the Bible does not need to be interpreted. We’ve been told that all we need is the Word of God, and that “the opinions of man” don’t mean anything. We’ve been encouraged, as western individualists, to study the Bible alone, believing that the Bible is clearly understood. What Bell is taking on here is the pop-religion of evangelicalism. What he says in this chapter is nothing that a first-year seminary student wouldn’t hear. However, it is not something that evangelicals usually hear from their pastors or Bible-study teachers (as if they fear that if they are honest about the difficulty of hermeneutics that people will lose their belief in Christ). Therefore, this chapter ruffles a lot of feathers. But the simple fact is this: The Bible must always be interpreted. And, honestly, many well-intentioned Christians have interpreted the Bible in ways that have been detrimental to the cause of Christ. And, even more honestly, you and I cannot be absolutely sure we have interpreted the Bible correctly. I applaud Bell’s candor here. And if it’s a shock to some Christians that the Bible is not always plainly understood, they need to learn what the evangelical idea of the “clarity (or perspicuity) of Scripture” means. As respected evangelical theologian Wayne Grudem writes, “The existence of many disagreements about the meaning of Scripture throughout history reminds us that the doctrine of the clarity of Scripture does not imply or suggest that all believers will agree on all the teachings of Scripture. Nevertheless, it does tell us something very important—that the problem always lies not with Scripture but with ourselves … we affirm that all the teachings of Scripture are clear and able to be understood, but we also recognize that people often (through their own shortcomings) misunderstand what is clearly written in Scripture.” (Systematic Theology, p. 109). Grudem affirms what a postmodern like Bell is saying: There is a problem with our ability to interpret the Bible. The problem is not with the Bible, Bell says, “because God has spoken, and everything else is commentary” (p. 52). “When we’re serious about dealing with the Bible as the communal book that it is, then we have to be honest about our interpretations. Everybody’s interpretation is essentially his or her own opinion. Nobody is objective” (p. 53). Grudem said that it is “through our own shortcomings” that we misunderstand Scripture. Bell is saying that the major “shortcomings” that we all have are our own agendas and perspectives. Anyone who says that they can read the Bible without biases and “just read it for what it says” is not owning up to the fact that nobody is capable of doing so. “The idea that everybody else approaches the Bible with baggage and agendas and lenses and I don’t is the ultimate in arrogance” (p. 54). So what does Bell suggest we do about this problem? Primarily, he says that interpretation must be done in the context of community. We need to interact with Scripture as we interact with each other. “Most of the ‘yous’ in the Bible are plural. Groups of people received these words. So if one person went off the deep end with an interpretation or opinion, the others were right there to keep that person in check” (p. 52). Amen to that. This manifests itself in a number of ways, I think: From a small group of people working through the Scriptures together in someone’s living room to scholars interacting with other scholars in books and journals, to everything in between. For instance, Bell writes this book, and a scholar like Ben Witherington calls into question Bell’s interpretation. (Ben Witherington, one of the top evangelical scholars in the field of first-century history, took issue with Bell’s understanding of “rabbi” and “binding and loosing.” Witherington's view is different from the sources that Bell cites: the Anchor Bible Dictionary, BDAG Greek-English Lexicon, and jerusalemperspective.com. See Witherington’s review of Bell’s book here.) Therefore, Bell's point is valid – in our desire to interpret faithfully, we need each other. Bells’ other suggestion to the problem of biblical interpretation I find paradoxical. Acknowledging that the Bible is still “alive,” he is seeking a way to move these ancient stories out of the cobwebs of the past and into our current experience. He understands, correctly, that each biblical story didn’t just “happen,” it also “happens” in our current experience. But how do we get to that current “happening” in our lives? On one hand, Bell suggests “what gives us strength and meaning and direction is something in addition to the historical events: it is the meaning of these events. Some call this the more-than-literal truth of the Bible. We live in the metaphors” (p. 61). The endnote here says, “Marcus Borg does a great job of explaining this idea in The Heart of Christianity." Here’s the paradox. Bell wants to have it both ways – the way of Borg and the way of Wright. The problem is that these two ways, while having some overlap, in the end are too disparate to ultimately reconcile. Just read the excellent book that Borg and Wright co-wrote, The Meaning of Jesus: Two Visions. The title says it all: these are two different “visions” of how to interpret the life of Jesus. One metaphorical (Borg), one historical (Wright). Sure, Borg and Wright are congenial to each other in the debate, but it should be clear to us that we must choose between a purely metaphorical interpretation and an interpretation that springs from the historical stories that we’ve been given. Bell is advocating for both; he wants to have his cake and eat it too. But this begs us to ask, how do we do it? What passages should we take as metaphor first (so that we can more readily apply it to our lives) and what passages should we take as the historic stories that reveal God’s redemptive purposes for us today? Bell seems to favor the latter (historical) over the former (metaphorical) in the overall tone of the chapter, but he confuses the matter by mentioning Borg’s hermeneutic and talking so much about metaphor. This seems a little jumbled in its thinking. Rob Bell is more interested in making sure people live the Christian life than making sure their doctrine is exactly right. He is more interested in orthopraxis than orthodoxy. His overarching metaphor for this in the first chapter of Velvet Elvis is jumping on a trampoline (check out the multiple book covers featuring people jumping in the air). He wants people to jump; he is not as interested in making sure they understand the springs of the trampoline (he refers to Christianity’s doctrines as the “springs”). He is critical of the form of Christianity that emphasizes correct doctrine over everything else. Not that doctrine is unimportant. Without doctrine, articulated by human words, there would be no springs to catapult us upward. But the springs, in Bell’s words, “aren’t the point.” The point is whether or not we are jumping; whether or not we are living the Christian life. And so Bell goes on these mini-tangents questioning such time-honored doctrines as the Trinity and the Virgin Birth. He says he believes these doctrines, but he wonders if we must insist that people affirm these kinds of things in order to be counted as Christians. And he wonders if so much emphasis on doctrine encumbers a life of vibrantly living for Christ. Exactly where do we draw the line around a set of doctrines that one must understand and believe in order for us to say, “Yea, that person is now a follower of Jesus Christ.” And is it even wise to say that one must affirm a certain doctrinal belief structure in order to authentically have a relationship with Christ? Granted, a person must meet the real Christ, not one made up and not one different than the person revealed on the pages of the Bible. And, also granted, a person should have a legitimate desire to know the reality of God that is only revealed on the pages of the Bible. But, and I ask this with great concern, what must a person affirm theologically before evangelical Christians would call that person a Christian? Can they be still learning to accept things like the Trinity or the Virgin Birth or even Penal Substitution? Or must they first articulate beliefs in these doctrines in order to be believers in Christ? In other words, when we say a Christian is a “believer,” do we mean that this person is a believer in sound doctrinal propositions or are we saying that they trust in the person of Jesus Christ? Bell is critical of what he calls “brickianity.” Instead of flexible springs for doctrine, some Christians believe that faith is built upon theological statements that are more like solid and unyielding bricks. “Often it appears as though you have to agree with all the bricks exactly as they are or you can’t join” (p. 28). “In brickworld, the focus often becomes getting people to believe the right things so they can be ‘in.’ There is often a list of however many doctrines, and the goal is to get people to intellectually assent to these things being true. Once we believe the right things, then we’re in. And once we’re in, the goal often becomes learning how to get others in with us” (pp. 34-35). This kind of rhetoric is what gets emerging church people in trouble. How dare they call into doubt orthodox doctrine? How dare they call into question the truth that the creeds, confessions, and doctrinal statements have articulated? How dare they say that people do not have to believe certain things in order to become Christians? The thinking is that this postmodern skepticism about understanding and believing truth is not a road that we should travel down. If we lose “truth,” the thinking goes, we lose Christianity, for Christianity is truth. But what is Bell actually saying? He is saying that the real “truth” is that we are limited in our ability to explain an infinite God with finite words. And since words are so limited, we must constantly be working on articulating God again and again in words that make sense to the present world. Bell is not denying truth. Bell is not denying reality. Instead, he is on a relentless quest for authentic truth and reality. And he is convinced that the Christian quest in the modern era for that truth and reality in mere doctrine missed the mark. The real mark is a vibrant life in relationship with God through Jesus Christ. He is convinced that, though we need to articulate what we believe in words and write them down as doctrines, these words and doctrines must be held loosely. We cannot ever be sure that we have arrived at a full and absolutely accurate description of God. We must always question ourselves and question God. We must always allow ourselves to doubt. “The very nature of orthodox Christian faith is that we never come to the end. It begs for more. More discussion, more inquiry, more debate, more questions” (p. 34). In making this point, Bell, at times, says things that are harsh to the evangelical ear. The things he says about the Trinity and the Virgin Birth are stated for shock value and, frankly, undermine his bigger point. He should have done better than this. But that bigger point is valid: Christianity needs to be defined more by who we know than what we know. It needs to be defined more by how we live than what doctrines we agree with. Christianity needs to be more than believing the right things about God and Jesus Christ; it must be a trusting relationship with God that manifests itself in a community that lives as disciples of Christ.